Richard Pousette-Dart (1916-1992) is now one of the less-clearly remembered of the New York Abstract Expressionists, especially here in the UK. He was however amply exhibited in America during his lifetime and also later, with solo shows at the Whitney in New York, the Museum of Modern Art, the Metropolitan Museum, the Guggenheim Museum, the Phillips Collection in Washington and the Philadelphia Museum. In addition, he made regular appearances during his career in the Whitney Annual and Biennial Exhibitions (seventeen times in all), plus others in the Art Institute of Chicago Annual exhibitions and the Carnegie International. Appearances abroad were less frequent. He was twice shown at the Venice Biennale (1949 and 1982), and also at Documenta II (1959). He was also an influential teacher. One of his students was Ai Weiwei, during Ai’s first period in the United States. The show of his work that has just opened at the Pace Gallery is the first to be presented in Britain. It is an elegant event, but it raises some awkward questions about the history and impact of 20th-century abstraction – most specifically about its role in America and its current international status. Abstract Expressionism did not begin as a strong political force but became so in the 1950s, when major touring shows of this new development in American art were organised in Europe, with covert assistance from the CIA. Most of the artists included in these exhibitions were immigrants – not born in the USA. Pousette-Dart, like Jackson Pollock, did not fall into this category. He was born in St. Paul, Minnesota, and grew up in Westchester County, New York. While some American politicians and influencers – those associated with Senator Joseph McCarthy – were violently opposed to America being associated with art of this kind, others recognised that it represented, when shown in Europe, a libertarian response to the artistic policies of the Soviet Union. Pousette-Dart was on the margins of this debate, but it inevitably provided a context within which his work was seen. He has been discussed by many major American critics. The publicity material offered by the Pace Gallery for the current exhibition provides a long list of distinguished names. How well does it stand up in the changed circumstances of the present day? It must be said, first, that this is an extremely refined show. In many ways, Pousette-Dart seems to have looked forward, towards Minimalism – a version of abstract art that didn’t become fashionable until the 1970s. This, however, is a weakness as well as a strength. Art now is becoming increasingly preoccupied with social issues. The simplistic narrative that capitalist abstraction triumphantly defeated socialist figuration is becoming more and more questionable. Exhibitions held here in London in 2017, to commemorate if not always to celebrate the Russian Revolution of a century earlier tended to prove that Russian Futurism, with its emphasis on abstract imagery, was a dead end – not wholly for political reasons, but because it an out of steam. Experimental figurative painting, often resistant to official Communist Party dictates, lived on in Russia. Pousette-Dart’s Proto-Minimalist images, seen in the context of the ways in which art is developing now, tend to seem rather cold and dated. Vaguely poetic titles – Magnetic Space, Radiance Number 8 – tend to reinforce this impression. Some paintings seem like sections of speckled terrazzo flooring, divided into large chunks and duly hung on a wall. Now and then the magic, otherworldly effect the artist seems to have been looking for works. 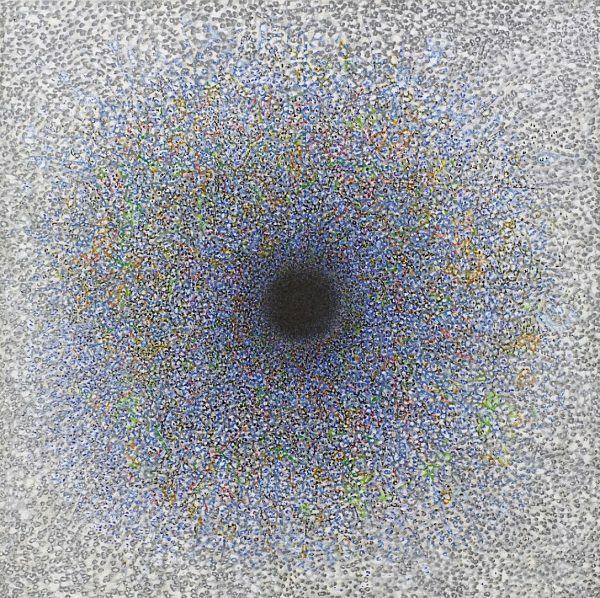 It does so with the image that more or less confronts you as you go in – a large Minimalist painting entitled Presence, Circle of Night, that employs a favourite motif – a circle centred within a square. Tellingly, it is dated 1975-76 – that is, from the time when Minimalism was reaching its peak in American art. Yes, there are some much smaller, much earlier abstractions dating from the 1940s that operate in a more conventional way. In addition, if you look on the Web, you’ll will find paintings that seem to be succumbing to the temptations of Romantic figuration. The characteristic circular motif, moved off-centre, now seems to be a harvest moon, hovering over a nocturnal landscape. But maybe that’s not what the artist intended you to see. The trouble is that how we see paintings of this sort, or indeed of any sort, is never entirely free, not only of our own previous artistic experiences but also of our everyday experiences in what we are pleased to call “the real world”. This can work positively, but it also works negatively, if we start to feel shut out, rather than being invited in. Born in Saint Paul, Minnesota on June 8, 1916, Richard Pousette-Dart ( b. 1916, Saint Paul, Minnesota; d. 1992, New York) was raised in Westchester County, New York. He briefly attended Bard College but left to pursue art on his own in New York City where he became part of the first generation of Abstract Expressionists. During his career, Pousette-Dart created a lexicon of biomorphic and totemic forms that provided rich visual and symbolic sources that he would explore throughout his long career in a multitude of painterly approaches. In 1982, Pousette-Dart was chosen by the International Committee of the Venice Biennale to exhibit in the main pavilion. His work has been the subject of solo exhibitions including the Whitney Museum of American Art (1963, 1974, 1998); Museum of Modern Art (1969); Metropolitan Museum of Art (1997); and Solomon R. Guggenheim Museum as well as the Peggy Guggenheim Collection in Venice, Italy (2007).